So we're going with gray dresses for the bridesmaids! There I said it! I finally made a decision! I'd been going back & forth with different blush tones & putting too much thought into it. I wasn't completely sold on pinks or purples... mainly because we're not sure on the colors of our flowers until we actually get down to Mexico & see what they have. If we went with pink dresses & only had purple flowers available - then it would clash. I decided my best bet was to pick a neutral, but pretty color that any bouquet of flowers would compliment. Is that a totally weird way of picking my bridesmaid dress colors? :) It made sense to me... so gray dresses it is! I am also one of those girls that jumped on the trend of miss-matched bridesmaid dresses. When I say jumped on that trend, I mean that I am absolutely in love with the idea! I love the idea that each girl will get to wear a dress that she feels the most comfortable & beautiful in. I've never been a fan of symmetry, or matchy-ness (is that a word? well it is now!) so miss-matched dresses seems like a great fit for our wedding. The last three photos below are some of favorites that I've seen floating around on the internet. Hooray for making decisions! I totally understand how that goes. I let my girls choose their own dresses too. It's perfect for everyone, they get to choose their look and price tag and you get to just sit back and chill and not stress over them. I loved it! I didn't even see most of their dresses till the day of and it went together so great! 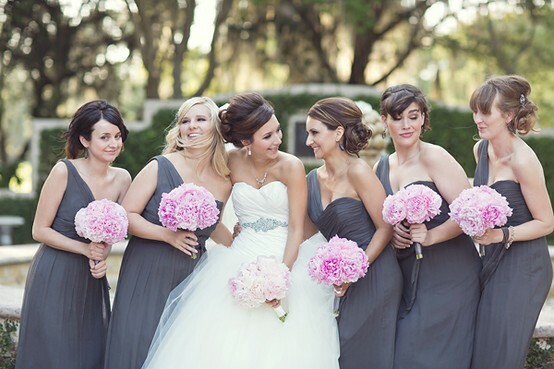 I absolutely love gray bridesmaid dresses! And the mis-matched is absolutely fabulous! My cousin is going to do that for her wedding too! Love it!! Thanks for linking up with me today on A Happy Wife in NOLA's Wedding Wednesday link up party!!! Yes mismatched are the way to go! I'm hearing from so many people that did the miss-matched look that it turned out great! I'll have to check out Light in the box, thanks for the rec! I think gray will be beautiful! And I love the mismatched look! I think the girls will feel beautiful and confident! Excellent choices! 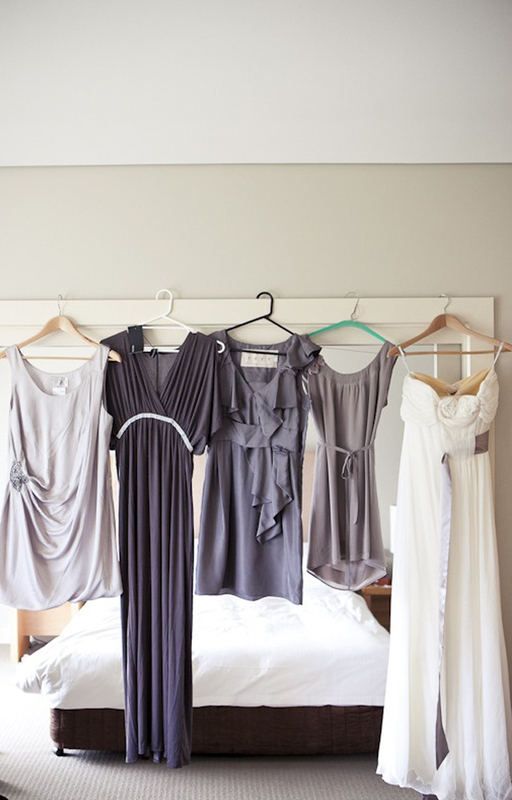 I LOVE grey bridesmaid dresses! They look great on everyone, stylish and add a contemporary yet comfy feel. Great choice :) Happy Wedding PLanning!! The mixmatched bridesmaids dress trend is genius. It's near impossible to find one dress style that suits everyone.